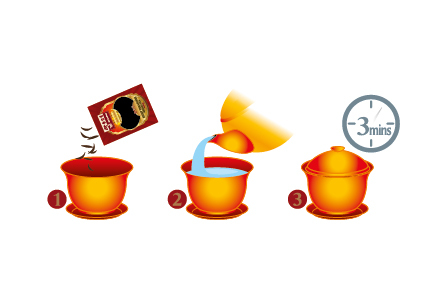 Eu Yan Sang Eight Treasures Herbal Tea Collection consists of 4 unique herbal tea blends. Each tea blend is a fusion of eight different flowers, teas and herbs. Not bound to just traditional tea lovers, this Eight Treasures Herbal Tea Collection is enjoyed by the young and old, perfect as a delectable treat for any occasion. A fine collection of 4 unique herbal tea blends for a truly delightful experience. Each blend is a fusion of eight ingredients containing flowers, teas and herbs creating an exquisite flavour. Wonderfully smooth in flavour, this harmonious floral tea blend with Lily and camomile as its key accents has a gentle and calming scent, which will soothe and relax the most frazzled of nerves. As China's most famous green tea, Longjing carries an initial fresh crisp taste with a long-lasting mellow sweetness. When paired with the succulent flavours of longan and wolfberry, the outcome is a delicious tea that's unforgettably great. Oolong is a widely appreciated black tea, rich in antioxidants and carries wonderfully deep flavour. Longans and wolfberries lend a light touch of sweetness that perfectly complements the full-bodied and earthly oolong. Harmonising the exquisite scent of alluring Rose petals with the blossoming flavours of jasmine, chrysanthemum and honeysuckle creates a lovely floral tea combination for a glowing complexion. Pour a sachet of herbal tea into cup. Add approximately 250ml of boiling water. Cover for 3 minutes before serving.